CoinField has a mix of features that cater to both advanced and casual crypto traders. Benefits like short transaction wait times, advanced charts and low commission fees are designed to attract professional traders. At the same time, beginners can use CoinField’s quick trade interface to get in the game and HODL. This exchange’s main downside is its low liquidity. CoinField is new, so its trading volume is low in comparison to more established crypto exchanges. In addition, CoinField charges more than most crypto exchanges for withdrawals. Advanced charts. Most exchanges only provide basic line and/or candlestick charts, but CoinField can display over 50 different technical indicators. Fast trades. CoinField’s quick transactions are facilitated by Ripple (XRP), a speedy cryptocoin that runs on a network of private gateways. These gateways are run by various banks, payment providers and universities. Beginner friendly. Casual crypto investors can use the exchange’s quick trade feature to buy and HODL. Quick verification. Equifax provides automated ID verification services for CoinField. This makes registering for the exchange a quick and painless process. Good currency support. With CoinField, you can trade XRP with 13 other cryptocoins. Low commission fees. With fees as low as 0.05% for maker trades in USD/XRP and BTC/XRP markets, CoinField offers some very competitive commission rates. High withdrawal fees. CoinField’s withdrawal fees are high compared to competing cryptocurrency exchanges. Not available in the US. US citizens can’t join CoinField. Low liquidity. CoinField’s low trading volume may pose a problem for frequent traders. What Can You Trade on CoinField? CoinField launched on February 13th of this year, but it used a multi-stage registration process to onboard users. Only 100 pre-registered users were allowed to join during the early days of the exchange. 500 more new users were brought in during the second week. This gradual process continued until the exchange opened its doors to the general public in March. In July, CoinField announced a new partnership with moonGO, a soon-to-be-released mobile app that will let you use your crypto assets to buy things in retail stores through Google Pay, Apple Pay or Samsung Pay. Various cryptos will be able to be bought and sold directly through the app as well. Earlier this month, CoinField partnered with Ripple and began using XRP as its base currency. The move lets CoinField users move funds quickly in and out of different exchanges and wallets. Babak Bob Ras – Co-founder, CEO. Before starting CoinField, Babak Bob Ras was a Senior Global Expansion Advisor at Hardex Brakes. Reza Bashash – Co-founder, CTO. Reza Bashash founded a number of internet startups, including a coupon site called SideBuy and a semantic search service called inextweb, before he helped debut CoinField. The AML/KYC policy section of CoinField website states that the exchange has opted to register with Canada’s Financial Transactions and Reports Analysis Centre of Canada (FINTRAC) as a Money Service Business (MSB). As a registered MSB, CoinField must follow all the regulatory requirements set by FINTRAC and other Canadian law enforcement agencies. Coin teams interested in having their coin listed on CoinField can submit a request here. 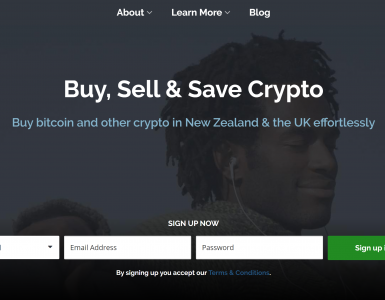 According to a CoinField knowledge base article, CoinField has partnered with Palo Alto-based blockchain security firm BitGo. BitGo’s advanced algorithms detect and flag any suspicious account activity. Other security measures that CoinField uses to protect its customers include multi-signature wallets, server isolation, advanced DDoS protection, 256-bit SSL, PCI compliant storage for sensitive user information and a multi-layer secure digital vault, which it uses to store digital assets offline. Fans of CoinField have praised its customer service team for providing personable and quick responses to questions. 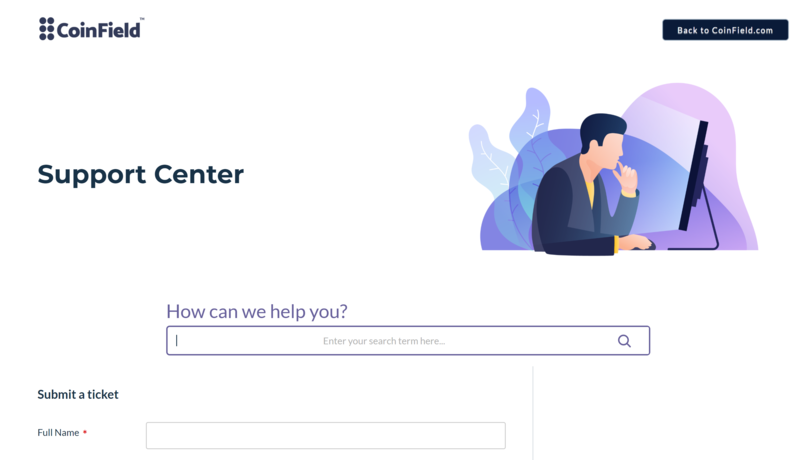 The exchange is one of just a handful of crypto exchanges that offers live chat support. CoinField’s knowledge base is extensive, with knowledge base articles that cover topics ranging from the differences between various trade order types to specific guides for buying various cryptocurrencies and more. Overall, CoinField seems to have a good reputation on Reddit and other cryptocurrency forums. However, some have criticized CoinField’s high withdrawal fees. Citizens of Canada, Mexico and most European countries can join CoinField. Americans can’t sign up for an account. Click here to see the full list of supported countries and here to view the list of restricted countries. CoinField’s automated identification verification system integrates with the consumer credit reporting agency Equifax. 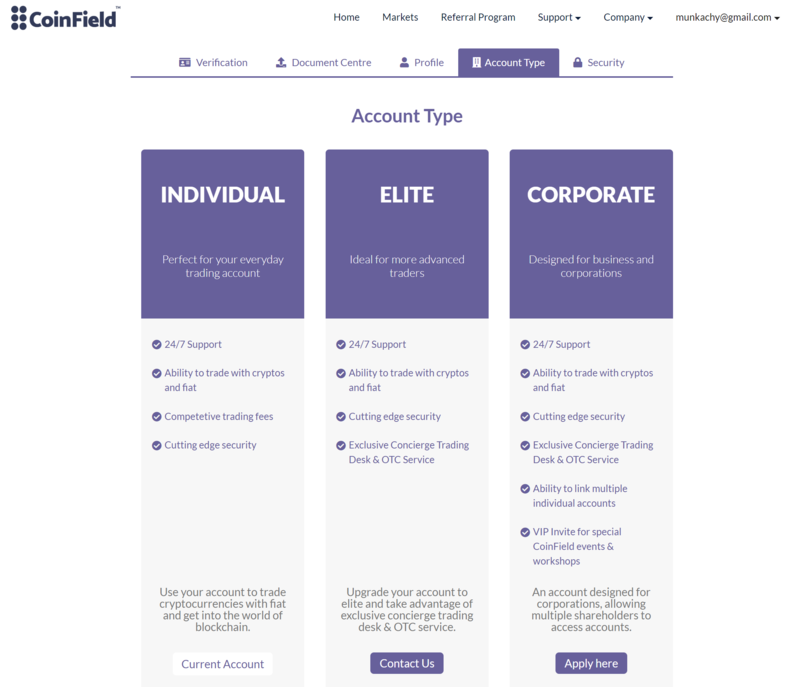 If your automated identity check fails, CoinField’s customer support team will manually review your information. In the meantime, you can continue to use CoinField as a tier 3 account. Level 6. Withdraw/deposit of up to $2 million per day. Level 5. Deposit up to $10,000 per day. Level 4. Manual account verification in progress. Level 2. Phone verification completed. Level 1. Email verification completed. Documents needed for verification include a selfie of yourself holding your government-issued ID and a note that contains the current date, your signature and a message that reads “For Cornfield.” In addition that, you’ll also need to send in a picture of a proof-of-address document. Acceptable proof-of-address documents include bank statements, credit card statements, insurance contracts, government tax documents, rental property agreements and utility bills. More details are available here. CoinField requires corporations to provide articles of incorporation, a certificate of corporate status, a corporation profile report, proof of address and several other official documents. Further details about the sign-up process are available here. Once approved, corporate accounts can take advantage of a number of extra perks. These perks include an OTC (Over-the-Counter) trading service, faster funds settlements, invitations to VIP events and a dedicated account manager. The following government-issued currencies can be traded on CoinField: US dollars, British pounds, Japanese yen, United Arab Emirates dirhams and the euro. All of the following XRP markets are available on CoinField: BTC/XRP, ETH/XRP, LTC/XRP, DASH/XRP, BTG/XRP, ZEC/XRP, ZRX/XRP, GNT/XRP, REP/XRP, OMG/XRP, SALT/XRP, BAT/XRP and ZIL/XRP. USD markets include: XRP/USD, BTC/USD, ETH/USD and LTC/USD. CAD markets include: XRP/CAD, BTC/CAD, ETH/CAD and LTC/CAD. EUR markets include: XRP/EUR, BTC/EUR, ETH/EUR and LTC/EUR. Other fiat markets: XRP/GBP, XRP/JPY and XRP/AED. CoinField lets you fine-tune your trading with limit and stop-limit orders. In addition, 50+ different technical indicators can be added to CoinField’s charts view. API access is available, but you have to contact CoinField directly and explain why you want to use its API if you wish to do so. Margin trading is not an option. 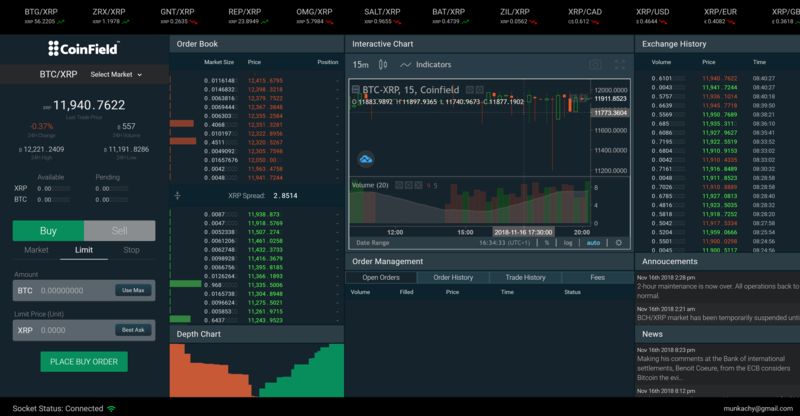 The first part of the interface that you’ll see when you log onto CoinField is the Dashboard. Here you can view tweets from cryptocurrency professionals and CoinField announcements. The next menu is Portfolio, which shows you how much money you have in your CoinField account. A separate “pending” column lets you know if there are any funds that are still in the process of making their way to your account. The Quick Trade menu lets you place market orders for all the cryptocurrencies that CoinField supports. 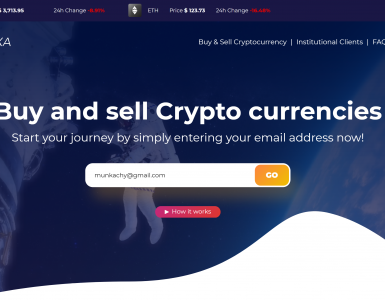 If you just want to buy some crypto and hold onto it, this interface lets you do that with ease. Next up is Advance Trade, which gives you access to CoinField’s excellent charts. Over 50 different technical indicator overlays can be added via the Indicators button above the chart view. The Transfer menu lets you access all your crypto wallets. You can also deposit and withdraw your fiat funds here. The My Orders menu lists all the pending orders that you’ve placed with CoinField. Trade History shows you all your completed transactions. You can find referral links for CoinField’s affiliate program in the Referrals menu. The Settings menu option takes you to the menu depicted below. Here you can check the status of your ID verification. In addition, you can also apply for access to CoinField’s OTC trading service. The next menu, Support, takes you to CoinField’s knowledge base. If you can’t find the answer to your question there, you can fill out a ticket and request help. CoinField doesn’t have any mobile apps. However, CoinField CEO Babak Bob Ras recently announced a new mobile app called moonGO. 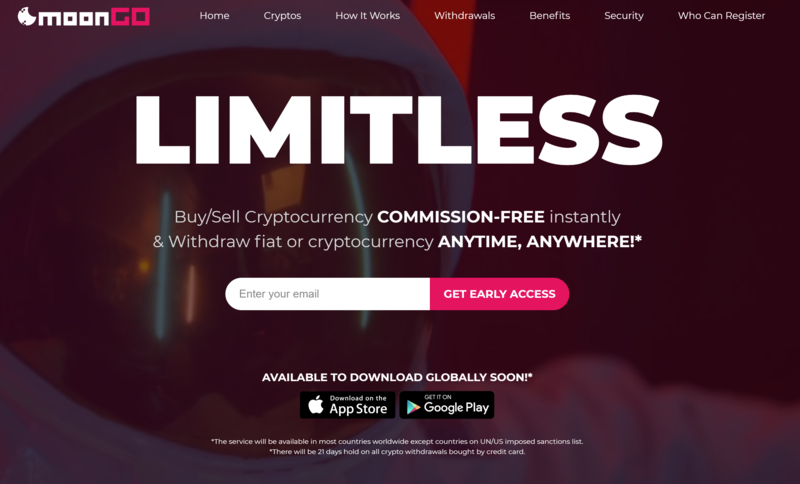 The app will facilitate commission-free crypto and fiat trades. It will also support Google Pay, Apple Pay and Samsung Pay. Deposits. Deposit options include wire transfer, Crypto Capital, SEPA, EFT and Interac. 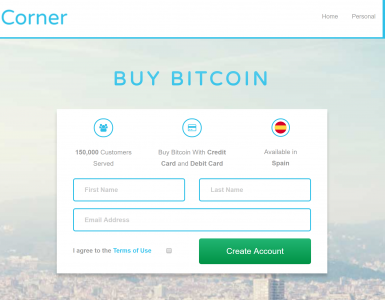 Credit card purchases are also available through the MuchBetter App. Most fiat deposits are free, but credit card purchases incur a 4.5% fee. Click here to see the full list of options. Withdrawals. Withdrawal options include PayPal Express, wire transfer, Crypto Capital, SEPA, EFT, the MuchBetter App and Interac. The lowest withdrawal fee is 0.5% for SEPA withdrawals. Most withdrawals incur a 1% fee. Click here to see the full list of options. Deposits. All crypto deposits are free. Withdrawals. XRP withdrawals are free. All other cryptos incur a small variable fee to cover the cost of mining charges. Click here to see the full fee schedule. CoinField’s commission fee schedule is competitive. Maker trades in the USD/XRP and BTC/XRP markets only incur a 0.05% fee. Taker fees cost 0.14%, which is also quite reasonable. XRP trade pair commission fees are 0.09% maker / 0.15% taker. CoinField does not award discounts to frequent or high volume traders. Prior to their February soft launch, CoinField’s executives announced their plan to “enter the market very aggressively” and “surprise everyone in Canada.” Since then, CoinField has delivered on that promise by expanding into markets outside of Canada and by opting to peg XRP as CoinField’s base trading currency. Even though CoinField’s most appealing features are designed to attract frequent traders, beginners will appreciate CoinField’s quick and intuitive interface. Support for credit card purchases is another convenient retail-oriented feature. CoinField’s advanced charts, XRP support and low commission fees are designed to attract the professional crowd. The exchange could go one step further by offering support margin trading.